WRS Interventional Radiologists John Tomashek, M.D. and James Beres, M.D. are performing outpatient Varicose Vein Treatment at the WRS Vein Center. 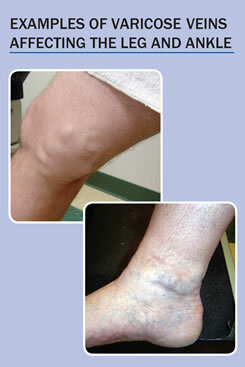 Varicose veins can be embarrassing and unsightly. But more than just aesthetics, varicose veins can be responsible for serious medical problems that include severe pain and skin ulceration. Ordinarily the calf veins function to return blood to the heart through a series of one way valves which prevents blood pooling in the legs. But, as yet another unfortunate consequence of aging, these valves can malfunction producing the problem we know as varicose veins. Failure within the valves can occur thorough a variety of means but most valves fail through either normal aging or from disease such as blood clots (deep vein thrombosis). The failed valve often results in blood that pools in the leg veins, enlarging them and often creating unsightly ropey structures that are often painful. Asthetic considerations aside, the alterations in the venous blood flow can sometimes make walking difficult. In some cases venous problems are severe enough to cause skin break down and skin ulcers. Historically the treatment of problematic leg veins involved surgical “vein stripping” where surgeons made incisions and actually removed the problem veins. More recently, endovenous laser ablation has been used to seal the veins from the inside out. This procedure, used by skilled WRS Interventional Radiologists only requires local anesthesia and a tiny skin incision to pass the small catheter. If you search the web for more information, most of the pages served up will be advertisements from medical practices, of which we are one. But how does one make an educated selection from so many different options and vein ablation providers? WRS physicians only use state-of-the-art ultrasound, and the best guiding catheters to treat venous disease without surgery. Who does the ultrasound procedure? Our WRS physicians perform all of the ultrasound procedures themselves – no outside sources are used. All of our doctors are board certified in both Diagnostic and Interventional Radiology. Wisconsin Radiology specialists works directly with your insurance carrier to have all procedures pre-authorized, taking the burden off of you. 1. EVALUATION – WRS schedules an ultrasound evaluation to determine the source of your leg symptoms and to help determine if Laser Vein Ablation is right for YOU. 2. PREAUTHORIZATION – WRS Radiologists work with your insurance to obtain the proper approval and preauthorization. 3. PROCEDURE – WRS will schedule all of your evaluation, procedure, and follow up appointmens at one convenient location. We will work with you to ensure that your experience with us is positive and that your treatment is successful. Click here to read the entire section of Wisconsin Radiology Specialists Commonly Asked Questions about Vein Ablation Procedures.